The Romans decided to build a city where London now stands because of its fine navigable river. Ocean going ships could transport people and supplies to this spot and river craft could provide access further into the interior. Over the centuries, London grew up along the banks of the Thames extending for several miles in either direction from the original location where London Bridge stands today. As a result, the river provides a good way to travel between many of London's visitor attractions. Undoubtedly, the most traveled secion of the Thames is the stretch between the Houses of Parliament in the west and the Tower of London in the east. At the western end, there is Westminster Pier, where several boat companies have tocket booths. They are often crowded with throngs of tourists - - individuals and groups - - but it does not take all that long to get a ticket. Almost directly across the river on the south bank is another pier in the shadow of the London Eye. At the western end of this stretch of the river is Tower Pier, which is besides the Tower of London. Cruising along this stretch of the Thames, you see such landmarks as the Tate Modern, Sommerset House, Shakespeare's Globe Theatre, the Golden Hinde II, HMS Belfast, and of course, Big Ben, the London Eye and the Tower of London. 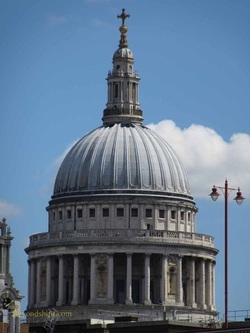 You get fine views of the dome of St. Paul's Cathedral and the skyline of London's traditional financial district, the City. Along the way, you travel beneath a series of bridges, each with its own character. 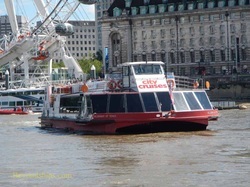 In addition to being a sightseeing vehicle, the boats also provide a leisurely means of getting from the cluster of attractions near the Houses of Parliament (e.g., Westminster Abbey, Downing Street, Traflgar Square, Buckingham Palace) to the attractions near the Tower of London (e.g., the City, St. Paul's, HMS Belfast, Tower Bridge). The boats that we traveled on had restaurants and bathrooms to make the journey more comfortable. Going eastward, we traveled on a tour boat operated by City Cruises. It had a large expanse of open deck with seating as well as an enclosed area forthose days when the weather is uncooperative. During the voyage, a crew member gave a commentary pointing out places of historical significance as well as various pubs, which he said he had personally researched during his off hours. The trip from Westminster to Tower Bridge took about half an hour. On the westbound journey, we took a much faster boat operated by Thames Clippers. This was a large, streamlined catamaran whose appearance boasts speed. It is not a tour boat per se, rather, it is a means of commuting along the river. The crew gave no commentary and the boat's interior was arranged like a very wide airplane with rows of tall comfortable seats between its tinted windows. 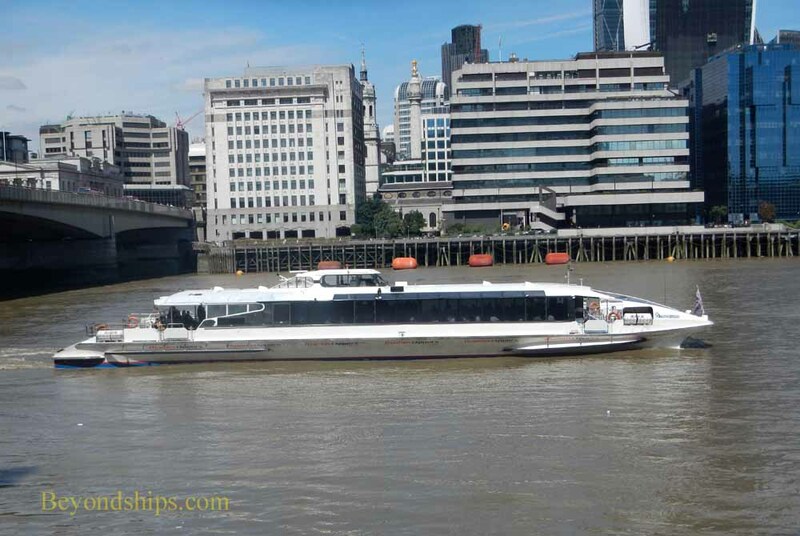 Because it is used by commuters, the boat made several more stops along the way than did the City Cruises tour boat. (Note: The clipper stops at the Embankment Pier near Charring Cross Railroad Station rather than at Westminster Pier). However, the time spent docking at the various piers was more than made up for by the boat's inherent speed. The boats come along about every 20 minutes during the day. While many visitors leave the river boats at the Tower of London, they are also a good way to get to the attractions at Greenwich. Indeed, Greenwich Pier is next to the Cutty Sark and only a few steps from the Old Greenwich Palace and the National Maritime Museum. The journey takes about another half hour on the City Cruises' boats. Along the way, you travel through the Docklands area. Once a busy ocean port, the warehouses and docks have been redeveloped into high end residences and businesses. You pass Canary Wharf and the Isle of Dogs, the new financial districts, with their tall glass towers that are more reminiscent of New York than old London town. In the other direction, the Thames Clippers make a few stops west of the Houses of Parliament going as far as Putney. As a result, you can go by boat from the Tate Modern to the Tate Britain. Also, Westminster Passenger Service Association offers cruises to Kew Gardens, Richmond and Hampton Court Palace. The river is the way King Henry VIII traveled between his London palaces and Hampton Court. The pier is close to the palace. However, because the Thames twists and turns, it takes more than three hours to make this journey. As a result, the boat has to begin its homeward journey shortly after arriving at Hampton Court. Thus, if you want to have time to explore Hampton Court, it is best to take the boat one way and the commuter train between Waterloo Station and Hampton Court the other way. The various boat opertors offer a variety of enhanced Thames cruises such as cruises with afternoon tea, dinner cruises and show cruises at night. 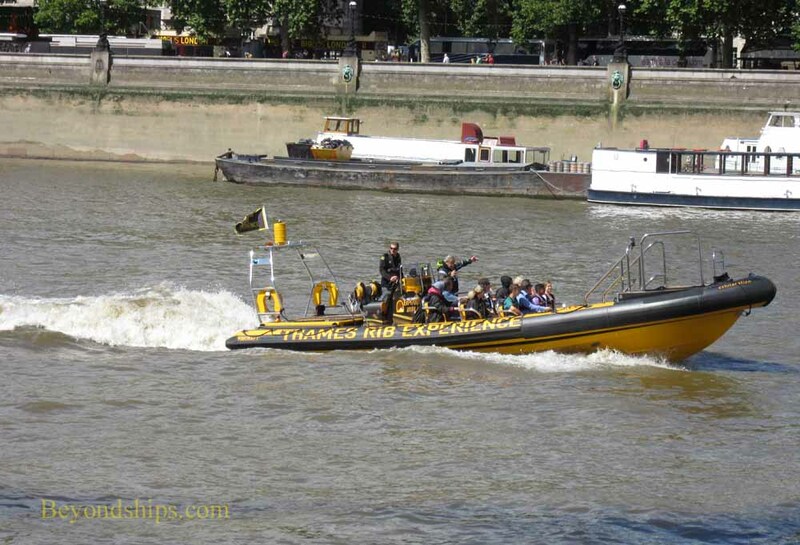 Another variation is cruises using RIBs - - military style Rigid Inflatable Boats. The primary attraction here is the thrill of high speed travel and sharp turns. Accordingly, guests are given wet weather clothing as these craft can kick up waves of spray. At one time, getting hit by Thames water would be the last thing you would want. Until the 19th century, the river was used to dispose of the city's untreated sewage. Much more recently, industrical pollution gave Old Father Thames an unsavory reputation as being biologically dead. However, thanks to environmental programs, the river today is considered clean with some 125 species of fish calling it home. Its murky appearance is due to the tides which stir up the river's muddy bottom. The boat operators offer several ticket options ranging from one way tickets to hop-on/hop-off packages. Generally speaking, it is somewhat more expensive than traveling by the Tube (subway) or public buses. However, it is a much more interesting experience. Some operators sell tickets online. Tickets can also be purchased at the booths or ticket machines at the piers.